The aim of this work was to assess the association between continuous glucose monitoring (CGM) data, HbA1c, insulin-dose-adjusted HbA1c (IDAA1c) and C-peptide responses during the first 2 years following diagnosis of type 1 diabetes. A secondary analysis was conducted of data collected from a randomised trial assessing the effect of intensive management initiated within 1 week of diagnosis of type 1 diabetes, in which mixed-meal tolerance tests were performed at baseline and at eight additional time points through 24 months. CGM data were collected at each visit. Among 67 study participants (mean age [± SD] 13.3 ± 5.7 years), HbA1c was inversely correlated with C-peptide at each time point (p < 0.001), as were changes in each measure between time points (p < 0.001). However, C-peptide at one visit did not predict the change in HbA1c at the next visit and vice versa. Higher C-peptide levels correlated with increased proportion of CGM glucose values between 3.9 and 7.8 mmol/l and lower CV (p = 0.001 and p = 0.02, respectively) but not with CGM glucose levels <3.9 mmol/l. Virtually all participants with IDAA1c < 9 retained substantial insulin secretion but when evaluated together with CGM, time in the range of 3.9–7.8 mmol/l and CV did not provide additional value in predicting C-peptide levels. In the first 2 years after diagnosis of type 1 diabetes, higher C-peptide levels are associated with increased sensor glucose levels in the target range and with lower glucose variability but not hypoglycaemia. CGM metrics do not provide added value over the IDAA1c in predicting C-peptide levels. The online version of this article (doi: 10.1007/s00125-015-3559-y) contains peer-reviewed but unedited supplementary material, which is available to authorised users. Partial recovery of endogenous insulin production (measured by C-peptide secretion) in the first few months after the onset of type 1 diabetes results in a significant restoration of glycaemic control with lower doses of exogenous insulin, commonly referred to as the remission or ‘honeymoon’ phase of type 1 diabetes [1, 2]. The Diabetes Control and Complications Trial (DCCT)  demonstrated that even beyond the first year of insulin treatment, maintenance of measurable C-peptide secretion was associated with significantly lower HbA1c levels, reduced insulin dose requirements and a reduced risk of hypoglycaemia when compared with patients without residual beta cell function. The DCCT also showed that better metabolic control of diabetes though intensive insulin therapy could slow the rate of loss of residual insulin secretion . More recently, Mortensen and colleagues demonstrated that an insulin-dose-adjusted HbA1c level (IDAA1c = HbA1c [%] + 4 × total daily insulin dose [U/kg body weight]) < 9.0 is a metric that consistently predicts substantial residual endogenous insulin secretion in young people with type 1 diabetes . 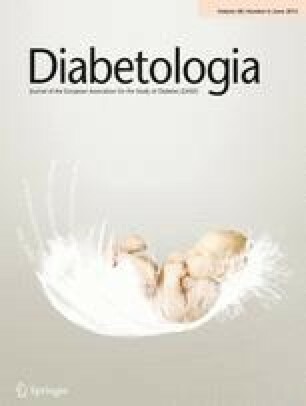 We recently completed a randomised trial that evaluated whether intensive diabetes management initiated within the first week of treatment of type 1 diabetes with an initial period of inpatient closed-loop insulin delivery followed by outpatient sensor-augmented pump (SAP) therapy could lead to greater preservation of beta cell function as compared with conventional intensive insulin therapy . In both the intensive group and standard (usual care) treatment groups, data on insulin use were collected, HbA1c levels were measured and residual C-peptide responses to mixed-meal tolerance tests (MMTTs) were determined during frequent follow-up visits over the first 2 years of treatment. In this study, the intensively treated participants were asked to use their SAP continuously using the Medtronic MiniMed Sof-Sensor, and the usual-care group wore a blinded Medtronic Guardian continuous glucose monitoring (CGM) for 3 days after each visit. Since the patterns of changes in HbA1c levels and C-peptide responses did not differ between the two treatment groups, we were able to pool the results from both treatment groups to examine the impact of changes in residual insulin secretion over time on CGM indices of glycaemic control, as well as on changes in HbA1c levels. We also sought to determine whether CGM data could be used, like the IDAA1c, as a metric to predict C-peptide levels in patients with type 1 diabetes. CGM is now commonly available and, unlike an MMTT, does not require admission to a research unit, or an intravenous line with multiple blood draws and C-peptide assays. If use of CGM data could serve as a surrogate for determining C-peptide levels by MMTT then there would be multiple benefits to the patient (no admission, no time lost from work and no intravenous catheter or multiple blood draws) as well as economic advantages (costs of the admission, blood processing, C-peptide assays and personnel time). In this study we therefore assessed several CGM indices of glycaemic control (per cent in range during the day and overnight and glycaemic variability) as surrogate measures of residual C-peptide secretion during the early phase of type 1 diabetes treatment. The randomised trial in which the data for this secondary analysis was collected was conducted at five clinical centres and was approved by each of the local institutional review boards. Written informed consent was obtained from adult patients and parents/guardians of minor patients, who themselves also provided written assent. The study is listed on www.clinicaltrials.gov (registration no. NCT00760526) and the full protocol is available online (http://direcnet.jaeb.org/Studies.aspx). The methods for the randomised trial have previously been described . In brief, 67 individuals (aged 7–45 years, mean [± SD] 13.3 ± 5.7 years; all but three were < 18 years old) with positive pancreatic autoantibodies were enrolled within 6 days of diagnosis of type 1 diabetes (mean 2.9 ± 1.7 days). Participants were randomly assigned to the intensive group or usual-care group in a 2:1 ratio. The intensively treated group received 3 days of hybrid closed-loop control (HCLC) using the Medtronic MiniMed ePID system (Medtronic MiniMed, Northridge, CA, USA) [6, 7, 8] followed by SAP therapy while the usual-care group received standard diabetes management. Study visits occurred 2, 6 and 13 weeks after study entry and every 3 months thereafter until 2 years. All 67 participants completed the 12 month visit and 65 completed the 24 month visit. Two hour MMTTs were performed to measure residual C-peptide levels using the standard TrialNet protocol [9, 10] at study entry, at 2 and 6 weeks, and at 3, 6, 9, 12, 18 and 24 months. HbA1c was measured at the Northwest Lipid Metabolism and Diabetes Research Laboratories using a dedicated TOSOH analyser (Biosciences, South San Francisco, CA, USA) and insulin use data were collected to calculate the IDAA1c, as previously described . CGM data were collected using the Medtronic MiniMed Sof-Sensor. For the intensive-treatment group, the CGM was downloaded at each visit. For the usual-care group, a blinded Medtronic Guardian CGM was worn for 3 days after each visit. CGM data were available for 267 (82%) of 327 completed visits in the intensively treated group and 98 (77%) of 128 completed visits in the usual-care group. The median number of hours of CGM data used for analysis at each visit was 168 (interquartile range 94–266) h in the intensive group and 70 (interquartile range 66–72) h in the usual-care group. Total daily insulin doses were obtained from pump downloads for those using an insulin pump. For those using multiple daily injections (MDI), insulin doses were obtained at the time of a visit by asking participants and their parents about their usual pre-meal and pre-snack insulin doses as well as their usual daily basal insulin doses. The peak MMTT C-peptide level was highly correlated with C-peptide AUC (Spearman r = 0.95–1.00, electronic supplementary material [ESM] Fig. 1) and was used as a measure of residual C-peptide secretion. Since there were no treatment-group differences in peak C-peptide levels at any time points, as previously reported , data from both groups were pooled for the analyses. All C-peptide values were transformed into a log scale using the formula y = log e (x + 1) due to the non-normal distribution of the data. Spearman correlation calculations were used to assess the cross-sectional association of HbA1c, IDAA1c  and CGM indices with C-peptide levels at each visit. Repeated measure least square models were used to assess the longitudinal associations, with within-subject effect and between-subject effect evaluated separately. The associations between CGM glucose indices, IDAA1c and C-peptide levels also were assessed at each visit to determine whether CGM measurements had an additional advantage beyond IDAA1c as a predictor of C-peptide levels. There was a gradual decline in C-peptide levels over the 2 years of the study and the percentage of participants with a peak C-peptide level > 0.2 pmol/ml decreased from 98% at 3 months to 59% at 24 months (ESM Fig. 2). The proportion of CGM-measured glucose values between 3.9 and 7.8 mmol/l was consistently associated with peak C-peptide levels across visits (p = 0.001 for both within-subject effect and between-subject effect, Table 1). When 60% or more of the sensor values were in the range of 3.9–7.8 mmol/l, the peak C-peptide level was always > 0.2 pmol/ml. However, for a given percentage of glucose values in this range, there was a broad range of peak C-peptide levels (Fig. 1a). When evaluated together with IDAA1c, time, for glucose values in the range of 3.9–7.8 mmol/l, did not provide additional value in predicting C-peptide levels (Table 1). There was a broad range of peak C-peptide levels for a given fasting CGM glucose level (readings between 04:00 and 06:00 hours) (Fig. 1b). If at least 40% of the fasting CGM measurements were within range, then 96% of the time the peak C-peptide level was > 0.2 pmol/ml. The positive predictive value for a given C-peptide level to predict the percentage of glucose values in range or for the percentage of glucose values in range to predict a C-peptide level was weak, Table 2. With respect to hypoglycaemia, peak C-peptide levels did not predict the percentage of glucose readings < 3.9 mmol/l, and individuals with peak C-peptide levels of 0.6–1.4 pmol/ml could still have frequent hypoglycaemic readings (Fig. 2a). With respect to glucose variability, higher peak C-peptide levels were associated with lower glucose variability (p = 0.02) (Fig. 2b). However, when evaluated together with IDAA1c, glucose variability did not provide additional value in predicting C-peptide levels (Table 3). For each individual and for the group as a whole, there was a correlation between peak C-peptide level and HbA1c level across time points (p < 0.001 and p = 0.01, respectively, for within-subject and between-subject effects, ESM Table 1). At all time points where the HbA1c level was < 6.0% (42 mmol/mol) the peak C-peptide level was > 0.2 pmol/ml. There was, however, a broad range of C-peptide levels for each HbA1c level and a broad range of HbA1c levels for each peak C-peptide level (Fig. 3); so, the positive predictive value for a given C-peptide level to predict an HbA1c level or for an HbA1c level to predict a C-peptide level was weak. There also was an association between changes in C-peptide levels between time points and changes in HbA1c levels between time points (p < 0.001 for both within-subject effect and between-subject effect) (ESM Table 2). However, longitudinal data showed that the HbA1c level at a particular visit did not predict the change in C-peptide levels at the subsequent visit and likewise peak C-peptide levels at a visit did not predict the change in HbA1c levels at the next visit (ESM Fig. 3). IDAA1c levels and C-peptide levels were associated at each visit (p ≤ 0.001) (ESM Table 3) as were changes between visits in IDAA1c and C-peptide levels (p = 0.03 to < 0.001) (ESM Table 4). In 99% of cases, when IDAA1c was < 9, peak C-peptide levels were > 0.2 pmol/ml compared with only 40% when IDAA1c was ≥12 (ESM Table 5). This analysis provided a rich dataset for evaluating the associations of C-peptide levels, HbA1c and CGM measures of time in range, hypoglycaemia and glucose variability early in the course of type 1 diabetes through both cross-sectional and longitudinal analyses. There was a strong correlation at all time points for the percentage of CGM values between 3.9 and 7.8 mmol/l and peak C-peptide levels > 0.2 pmol/ml (p = 0.001). Although we found strong statistical associations between C-peptide levels, CGM measures and IDAA1c levels at each time point as well as in changes from one time point to the next, CGM indices were not predictive of C-peptide levels after accounting for IDAA1c. The only other published study using CGM data as a marker of C-peptide secretion involved islet transplantation in which CGM data were used as a measure of graft function (C-peptide secretion) . In that study, a composite score was used to assess graft survival (the β-score ) and the peak C-peptide level following an MMTT was not specifically measured; eight subgroups were used for the β-score, whereas we had a continuous variable (peak C-peptide concentration). They found a strong negative association between the β-score (higher score equals more graft function) and the mean CGM blood glucose level (r = −0.65), the glucose standard deviation (r = −0.71), hyperglycaemia (r = −0.71) and hypoglycaemia (r = −0.45) . At 3 month intervals over the first 2 years following diagnosis of type 1 diabetes we found correlation coefficients ranging from 0.36 to 0.55 for peak C-peptide levels and the percentage of CGM glucose values between 3.9 and 7.8 mmol/l. We found a weaker association between the CV of glucose values and peak C-peptide levels (r = −0.12 to −0.53) and an even weaker association between peak C-peptide levels and the percentage of hypoglycaemic readings (r = 0.07–0.31). The IDAA1c has been proposed as a surrogate marker for a partial remission by Mortenson et al  who found that there was a significant correlation between the IDAA1c score and stimulated C-peptide levels at 12 months following diagnosis of diabetes (R 2 = 0.31). Our results are similar to those of Mortenson et al. We found a correlation coefficient of −0.65 between IDAA1c and stimulated peak C-peptide levels at 12 months post-diagnosis of type 1 diabetes, with an IDAA1c level of < 9 being virtually always associated with a peak C-peptide level > 0.2 pmol/ml. However, when IDAA1c levels were ≥ 9, C-peptide levels were often > 0.2 pmol/ml (ESM Fig. 4 and ESM Table 5). A similar situation was seen when using CGM data to predict the presence of residual C-peptide secretion. As seen in Fig. 1a, if > 60% of sensor values were between 3.9 and 7.8 mmol/l, 100% of patients had a peak C-peptide > 0.2 pmol/ml; however, a large majority of patients with < 60% of their readings between 3.9 and 7.8 mmol/l also had positive C-peptide secretion. Glucose variability, as measured by the glucose CV, did not provide a clear cut point for determining C-peptide levels > 0.2 pmol/ml (Fig. 2). We were initially disappointed that CGM-measured metrics did not seem to provide additional value to IDDA1c levels in predicting C-peptide levels. However, this is not completely unexpected since the CGM data reflect glucose values, similar to HbA1c, while the IDAA1c also adjusts for the amount of insulin the patient is taking. Clinically, it has been commonly observed that near-normal fasting meter glucose values with a small standard deviation (fasting glucose values < 7.8 mmol/l and a standard deviation of < 2.8 mmol/l) correlate with the ‘honeymoon’ phase of diabetes. In the current study, if more than 50% of ‘fasting’ CGM readings (between 04:00 and 06:00 hours) were in the range 3.9–7.8 mmol/l there was a high probability of having a peak C-peptide level > 0.2 pmol/ml. However, there were many individuals with 0–50% of their fasting glucose levels between 3.9 and 7.8 mmol/l who still had significant C-peptide levels, so overall fasting CGM levels did not predict peak C-peptide levels (Fig. 1b). It was even more surprising that there was a lack of association between C-peptide levels and CGM-measured hypoglycaemia. In the DCCT, maintaining residual C-peptide secretion was associated with a significant decrease in the incidence of severe hypoglycaemia . In a previous study, a good correlation of residual C-peptide secretion with a lower incidence of hypoglycaemic readings on CGM was demonstrated . In that study, 16 participants with recently diagnosed diabetes and measurable C-peptide levels (mean 0.96 ± 0.42 pmol/ml, ranging from 0.46 to 1.96 pmol/ml) had a 0.3% incidence of hypoglycaemia, and a group of individuals with a mean duration of diabetes of 7.6 years and who had similar HbA1c levels (6.8% [51 mmol/mol]) had a 7.6% incidence of hypoglycaemia. Of interest, in that study an age-matched control group had 1.7% of their CGM readings < 3.9 mmol/l despite not having diabetes , which may be a result of false hypoglycaemic readings obtained with the CGM, which was the same CGM system as used in the current study. In the current study, 76% of CGM downloads from study participants, more than 10% of whom had CGM readings < 3.9 mmol/l, showed significant residual C-peptide levels of 0.57–3.08 pmol/ml resulting in findings of a positive correlation between increased C-peptide levels and a higher incidence of hypoglycaemia. This may be explained by aggressive insulin management producing a higher incidence of hypoglycaemia even in individuals with residual C-peptide secretion. In summary, the use of CGM holds the promise of correlating glucose levels, glucose variability and hypoglycaemic risk to residual C-peptide levels. With the accuracy limitations of the CGM sensor used in these studies (mean absolute relative difference of 16% ), these correlations were no better than use of the IDAA1c. In home use, sensors may exhibit biofouling, which results in low sensor glucose readings; calibrations performed at times of rapid glucose rate of change or with inaccurate meter readings may also have significant impact on sensor accuracy. In addition, individual sensors may vary in accuracy due to the manufacturing process, and sensor artefacts can result from pressure (e.g. patients sleeping on sensors) [16, 17, 18, 19]. We anticipate that newer, more accurate, quieter sensors may provide additional benefits in predicting C-peptide levels, but this will need to be determined in future studies. We greatly appreciate the families who made a decision to participate in this study—a decision that was made within days of diagnosis of type 1 diabetes, at a time of significant stress. Data from the randomised trial from which these data were collected were presented as a poster at the 74th Scientific Sessions of the American Diabetes Association in 2014. This research was supported by National Institutes of Health (NIH)/National Institute of Child Health and Human Development (NICHD) grants to the Diabetes Research in Children Network (DirecNet) Study Group (HD41890-10, HD41906-10 and HD41908-10) and grants to the Type 1 Diabetes TrialNet Study Group (U01DK085509, U01DK06104211, 5U01DK085466-05, U01DK085505-02 and 5U01DK085465-04). Type 1 Diabetes TrialNet is a clinical trials network funded by the NIH through the National Institute of Diabetes and Digestive and Kidney Diseases (NIDDK), the National Institute of Allergy and Infectious Diseases (NIAID), the Eunice Kennedy Shriver NICHD, the National Center for Research Resources (NCRR), the JDRF and the ADA. Barbara Davis Center for Childhood Diabetes, University of Colorado School of Medicine: CTRC grant number 1UL1 RR025780. Division of Pediatric Endocrinology and Diabetes, Stanford University: Clinical and Translational Science Award SUL1 RR025744 for the Stanford Center for Clinical and Translational Education and Research (Spectrum) from the NCRR, NIH. Department of Pediatrics, Yale University School of Medicine: Grant Number UL1 RR024139 from the NCRR, a component of the NIH, and the NIH Roadmap for Medical Research. Its contents are solely the responsibility of the authors and do not necessarily represent the official view of the NCRR or NIH. Information on Re-engineering the Clinical Research Enterprise can be obtained from http://nihroadmap.nih.gov/clinicalresearch/overview-translational.asp. Department of Pediatrics, Indiana University School of Medicine: Indiana Clinical and Translational Sciences Institute. CTSA grant number UL1-RR-25761 from the National Center for Research Resources, NIH. Division of Pediatric Endocrinology, Vanderbilt University Medical Center: CTSA grant number UL1TR000445 from the National Center for Advancing Translational Sciences. Its contents are solely the responsibility of the authors and do not necessarily represent official views of the National Center for Advancing Translational Sciences or the NIH. Medtronic MiniMed (Northridge, CA, USA) lent the insulin pumps and provided the reservoirs and infusion sets for the pumps at a discounted cost. The company also provided technical support for using the Control Tool software and Martin Cantwell from the company trained the staff at each clinical centre how to use this system. Medtronic MiniMed, also provided the MiniLink transmitters and UltraLink meters at no cost and provided the Sof-sensors at a discounted cost. This research was conducted with support from the Investigator-Initiated Study Program of LifeScan (Milpitas, CA, USA) and they provided the One Touch Ultra2 meters, test strips and control solution at no cost. BB received payment from Medtronic, Sanofi-Aventis, Halozyme, Tandem, Animas, Becton Dickinson and Novo Nordisk for serving on Medical Advisory Boards and received institutional payment from Medtronic and Dexcom for other PI-initiated studies and sponsored research. CK has consulted with Diabetes Technology Management (DTM). SAW consulted for Johnson & Johnson, Becton Dickinson and Medtronic, received payment for lectures including service on speaker bureaus from Eli Lilly and received in-kind support for research from Medtronic. AAB consults for the American Humane Society on projects regarding animal-assisted therapy for paediatric patients and has received payment for lectures from Pfizer. RS serves on the medical advisory board for Medtronic. WT works as a consultant for Medtronic Diabetes, LifeScan/Animas, Novo Nordisk, Sanofi-Aventis and UnoMedical. JF consults for Merck. All other authors declare that there is no duality of interest associated with their contribution to this manuscript. BB, PC and RWB drafted this article, researched data, contributed to discussion and reviewed and edited the manuscript. CK, KJR, RS, AAB, JF, SAW and WT researched the data, contributed to discussion and reviewed and critically revised the manuscript. All authors reviewed and approved the manuscript to be published. RWB is the guarantor of the manuscript and, as such, had full access to all the data in the study and takes responsibility for the integrity of the data and the accuracy of the data analysis. This manuscript was reviewed and approved by the Steering Committee for the study and the TrialNet Publications Committee.